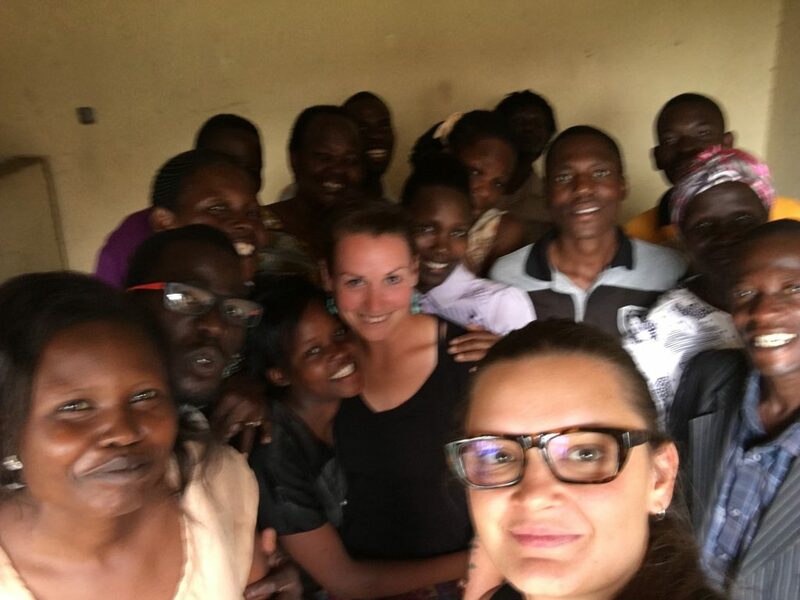 Aleksandra Lukasiwicz is an intern working with CAP Network partner CAPAIDS-Uganda as part of the International Youth Internship program funded by Global Affairs Canada. I boarded my flight to Uganda three weeks ago and promised myself that I wouldn’t have any expectations for the journey I was setting out on for the next six months. That’s not to say that I came into this without specific goals and desires for growth, but I wanted to come into a new country without any preconceptions, assumptions or impressions. And frankly I’m glad I did. Jennifer and I arrived on a hot Wednesday afternoon, coming a long way over 30 hours. We were collected in Entebbe by Eric Otim, a volunteer for CAP-AIDS Uganda – the local organization we have been working with since arriving – and taken to our hotel in Kampala. For the duration of the ride my eyes, ears, nose and mouth were wide open. A layer of sweat had developed almost immediately after leaving the air conditioned airport, my shoes already had a dusting of the quintessential African red soil, and as we navigated into the big city I saw cows and goats walking in stride with people, inhaled the stark smell of smoke, livestock and humidity, and heard lots of different noises, from honking horns, to roosters crowing, and the commotion of the very populated streets. After crashing for a good twelve hours, feeling rested, Jennifer and I joined Eric at the office the next day to meet some staff from CAP-AIDS Uganda’s sister organization, Farm Radio International (FRI). We were briefed on some of the previous projects and current needs for the organization and its partners by Tracy Akwii, a former CAP-AIDS employee, now working for FRI. She set up a meeting to visit the Needy Support Centre (NSC) group, a community based organization and beneficiary of CAP-AIDS, in the Nakawa region of Kampala for the next morning. Jennifer and I arrived early at the office, excited to get into some work so quickly after arriving. What we didn’t consider was the infamous “African time”, where things seem to happen at a much slower pace and quite often with delays. The Uber driver (yes, Uber in Kampala – Calgary take note) was nearly an hour late. When he finally arrived we immediately took off and the sensory adventure ensued. Through the congested streets of Kampala I could feel the perspiration reaching a new level, hear the sounds of hundreds of boda bodas (moto taxis) weaving through traffic, smell the aroma of rolexes (a very tasty local street food consisting of an omelette wrapped in chapati) mixed with smog. As we pulled into the Nakawa region, the Uber driver took his car down roads I thought were only suitable for off road vehicles with 4×4 – definitely not a Toyota Corolla. I grasped tight onto the dash, closed my eyes and hoped for the best. We were greeted by the members of NSC and invited into their meeting space with open arms. At the meeting we were given details about the group, how they developed a Village Savings and Loans scheme with the last interns and how it has benefitted the group. Throughout the meeting I was overcome with awe at how such a marginalized group has come together and worked so hard to support each other and thrive. It is truly inspiring. We each were given our Ugandan names, mine being “Lakisa”, meaning “the grace”. At this point I was overcome with emotion, to see how welcoming the group was, how resilient and determined, how organized and happy to share their stories. Now I must admit that I’m a person who wears her emotion on her sleeve – I cry during movies, television shows, when reading books, hearing stories, and even sometimes during a good commercial – but I didn’t want my emotions to come off the wrong way to the group. I was moved because I was impressed and proud. I am looking forward to our next visit with NSC when we go to do some more in-depth follow up on the micro-project that they implemented. The next day our travels continued with a six hour bus ride north to Lira, our home for the next few months. Another sensory endeavour. The bus was packed full making the heat even more exaggerated. The highways weren’t always great and it was a bumpy ride with stops in several villages where we would go through local “drive-thrus”. In other words, the villagers would rush to the windows and offer up their fruits, meat skewers and beverages for sale. I opted for a Mirinda soda, a sugary cream soda variation. 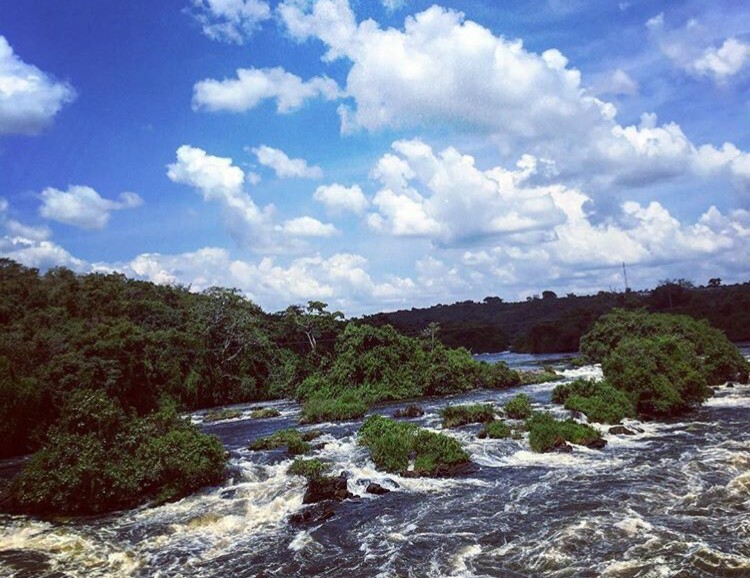 I’d like to credit the sugar high for getting me through the last hour of the bus ride, from which I witnessed incredibly lush vegetation and even a glimpse of Karuma Falls, on the Victoria Nile. We arrived to Lira in the afternoon, were warmly welcomed by CAP-AIDS Uganda’s Project Coordinator, Lawrence Gege and taken to our apartment. 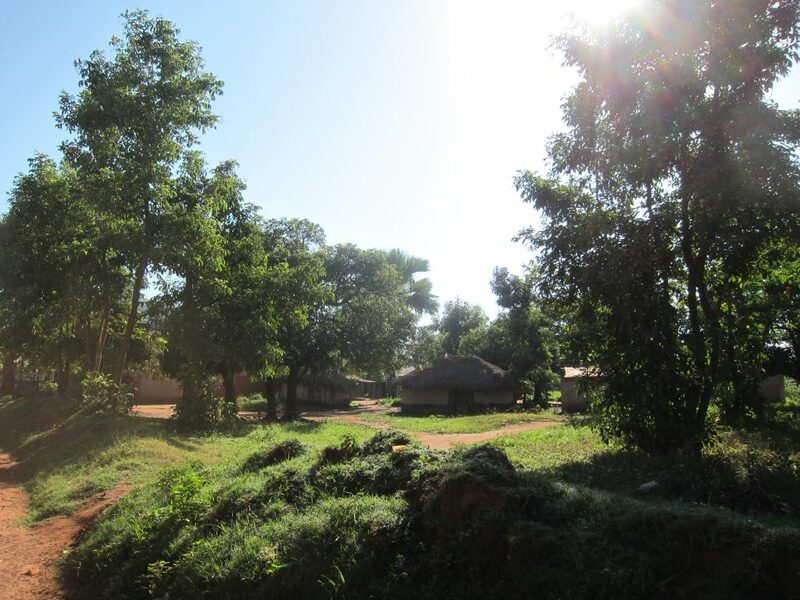 Over the next few weeks we dove head first into familiarizing ourselves with the work and past projects of CAP-AIDS Uganda and exploring the town. 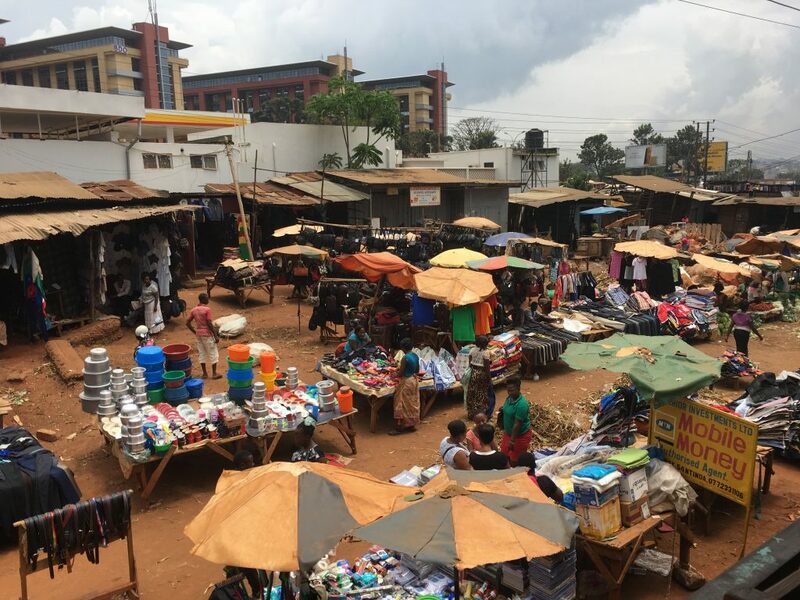 Though it is still quite a bustling place, it was a welcome change to the big city chaos of Kampala. It is much more rural, with lots of greenery, people riding bicycles, and animals everywhere. There is still a lot of sensory stimulation between the mass burning of banana leaves, the odd but somehow delicious pastiness of matooke (steamed and mashed plantain), the barking dogs that keep me up at night, the sight of women sitting side saddle on a speeding boda boda while holding their baby, and of course, the inescapable heat. It’s overwhelming, it’s fantastic. I experience something new every day and I can’t wait for more!